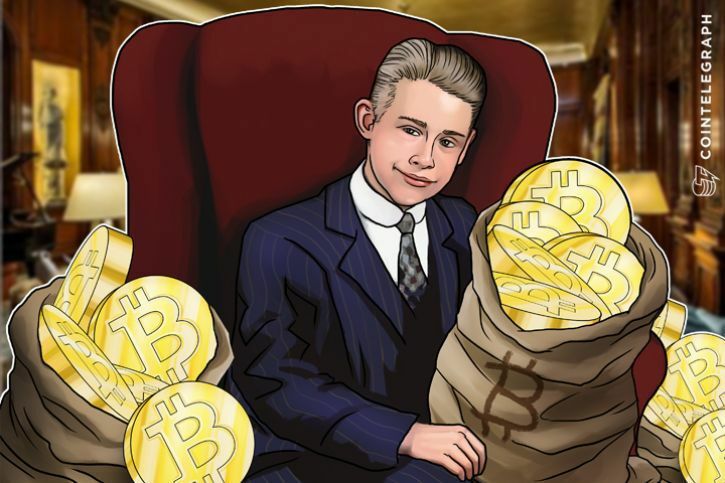 Erik Finman, a millionaire teenager who initially invested in bitcoin in May 2011 at the age of 12, recently explained in an interview with Mic that he is not convinced about Ethereum. Six years ago, Finman’s parents, Stanford PhDs, agreed to allow Finman to skip college and pursue his education elsewhere, outside the traditional realm of college and university ecosystem, if he could turn $1,000 in cash granted by his grandmother into $1 million. Within a six-year period, Finman acquired $1,000 worth of bitcoin at around $12 per bitcoin and also obtained other cryptocurrencies such as Ethereum’s native token Ether. Finman revealed during his interview with Mic that he currently holds more than 600 bitcoin, which is worth just about $1 million. Instead of pursuing higher level education at prestigious educational institutions and universities, Finman explained that he will be focusing on establishing a startup involving cryptocurrencies such as bitcoin and contribute to the development of a satellite in NASA’s ElaNa program. Finman’s diverse portfolio of cryptocurrencies also include Ether, the market’s second largest cryptocurrency with a market cap of $18.7 billion. Over the past 12 months, the market cap of Ethereum’s Ether increased from $980 million to $18 billion, by a rate of over 18x. For a brief period of time, Ethereum’s market cap closed on the market cap of bitcoin at $36 billion. After a major market correction which led to the decline of the entire cryptocurrency market, Ethereum’s value nearly halved, to $18 billion. Although Finman does maintain a portfolio of cryptocurrencies including Ethereum, he explained that he’d encourage other traders to go short on Ethereum. There is a lot of money to be made in the short-term but at the moment, the market cap of Ethereum is difficult to justify, considering the lack of viable products that emerged within the ICO market. In regard to ICOs, Finman also stated that newer cryptocurrencies are susceptible to pump and dump schemes. Earlier this month, Pieter Levels, the founder of Nomad List, also expressed his concerns over the ICO market and the overwhelming amount of money being poured into the market that lacks viable projects with active user bases. The vast majority of products and software are yet to enter pre-alpha phase in development and many projects are also attempting to take advantage over the bubble-like market. “The Ethereum/blockchain-based pump and dump scam: launching coins that don’t solve any problem but getting your audience to buy in. This is the 5th person who pitched this to me including Ethereum’s ex co-founder. It’s another dark internet scam robbing people of their money,” said Levels. In a blog post, Fred Ehrsam, the co-founder of Coinbase, explained that the Ethereum network will have to scale or improve at a rate of 100 times in order to serve 1 to 10 million users. Currently, Vitalik Buterin, the co-founder of Ethereum, believe Ethereum’s scalability is poor, as CCN previously reported. The Ethereum Foundation is also planning an alteration from proof of work (PoW) to proof of stake (PoS) consensus protocol to drastically scale the Ethereum network and support newly emerging ICOs and decentralized applications. “These are hard computer science and game theory problems. Most of them have never been solved before. Estimating completion can be hard and can be far off. Large apps can’t run solely on chain and likely never will. They need off-chain scaling solutions. While it’s tricky to make accurate estimates when combining scaling improvements, it’s conceivable we could see a 100x improvement by the end of 2018, which would allow a 1–10m user app,” wrote Ehrsam. In the long run, the emergence of decentralized applications with actual user bases and successful scaling of Ethereum will justify the network’s value. At the moment, analysts including Finman are not convinced about Ethereum yet.